Continuation from the previous 125 parts, the whole series can be found at http://www.nikoport.com/columnstore/. I have a huge love for the DBCC CLONEDATABASE command – it has been made available (backported) to every SQL Server version starting with SQL Server 2012, since the original release in SQL Server 2014, while being constantly improved in the Service Packs and Cumulative Updates. 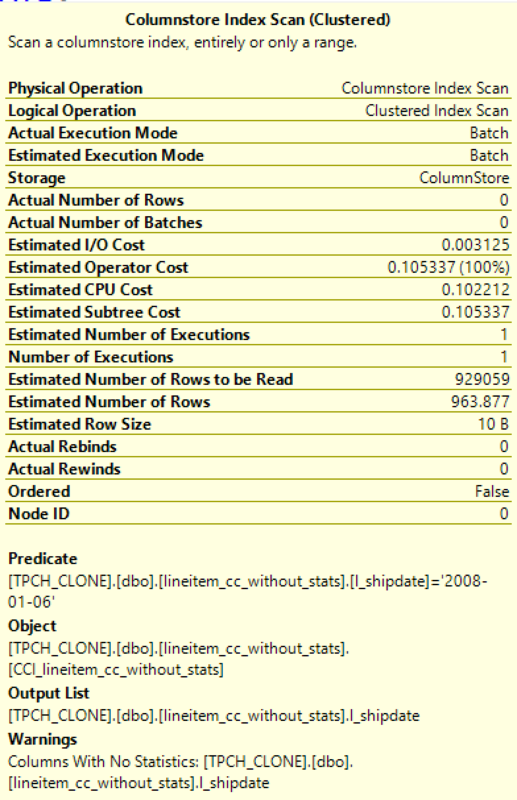 This blog post is focusing on the Database Cloning improvement in the SQL Server 2019 that is already available in the public CTP 2.0 – the possibility of the automated statistics extraction for the Columnstore Indexes. Well, there was quite a significant problem with the Columnstore Indexes previously – the statistics for them were not extracted into the cloned database, unless you did created the statistics in the most recent step before Database cloning. 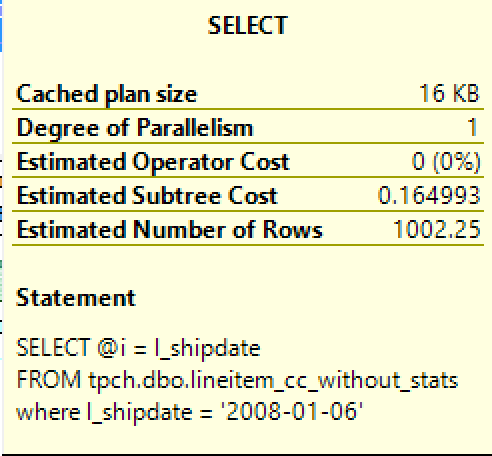 Let’s view a simple example of the situation on the SQL Server 2019 and for the purpose of testing I will be using a 10GB copy of the TPCH sample database, that can be easily generated with the help of the free software, such as the HammerDB. There is a small detail, a significant difference with the Rowstore Indexes – while for the Columnstore Indexes the statistics objects are being created, and while they are populated with data – they are not persisted. This is not a big thing for your live production system, unless you are trying to extract/stream out the statistics object. Both objects are available and none of them are user-created or temporary. The overall estimated cost on the image is 0.164993 with estimated 1002.25 rows estimated – and there are no quirks, as we are working directly with a real production database that has a concrete data. The actual execution plan looks pretty much the same with one important detail – there is a warning sign on the Columnstore Index Scan iterator! Investigating it a little bit – by hovering the mouse cursor over the iterator with the warning sign we can see that the Query Optimiser is advising us that we have columns with no statistics! It is also to notice that the expected number of rows to be read from our Columnstore Index is different – instead of the 1.000.000 rows as in the original execution plan, we have 929059 rows ! 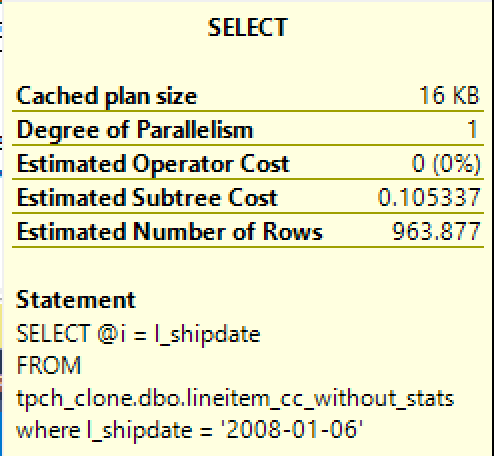 This is not just around 8% of the difference, this is huge when you are trying to emulate and generate plans in the clone database that are expected to be the same as in the production database – in the complex execution plan the skewing will raise into 100s & 1000s of % within just a couple of joins, while we would expect to see the very same plans! We need to see the overall expected execution plan cost – and here it on the right side, showing us that we just have 0.105337 instead of the original 0.164993 representing an unhealthy difference of the whooping 63%! This was not what one would expect, right!? On the pictures above you can see both execution plans being similar in the form and shape and without any warnings whatsoever! I won’t be able to show you the stats on the SQL Server 2019, because they will provoke more thoughts and questions then I am ready to invest in this current blog post, and I guess that CTP 2.0 still far from being ready and some of the features are still buggy – but we can see that the results and the queries do not suffer from the differences on SQL Server 2019, while they do on SQL Servers 2017, 2016, 2014. If you are unsure of how to fix the Columnstore Indexes in the Cloned Database problem on the previous editions of SQL Server, then please consider reading the following article from Parikshit Savjani (SQL Tiger Team) and use the update script from the Tiger Team to solve it. I love the fact this rather simple but important improvement finally made into the engine. No more streaming of the Columnstore Tables tricks will be needed, but I truly hope that this improvement will be backported into the SQL Server 2017 & SQL Server 2016 … Should not be that much of a game changer that someone will decide not to upgrade to SQL Server 2019, but it is a huge pleaser and promoter of the DBCC CLONEDATABASE command, which in my eyes is one of the coolest and underrated features of the late SQL Server releases. Auto_create_statistics here is on , so column statistics are created but they are never used. Only columnstore index stats object is used in query even if we use the same column in filter. 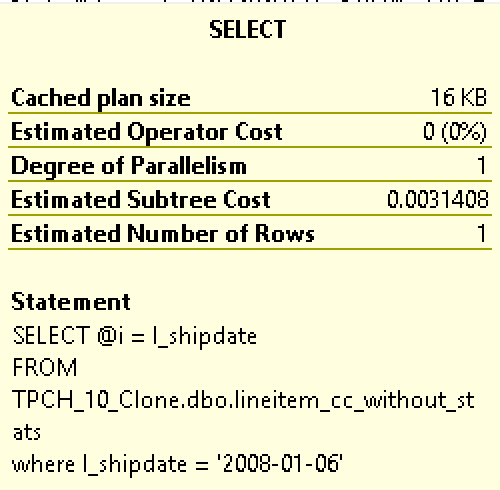 Column level statistics always persisted in clone too and same. But they are never used. Only columnstats object is used. 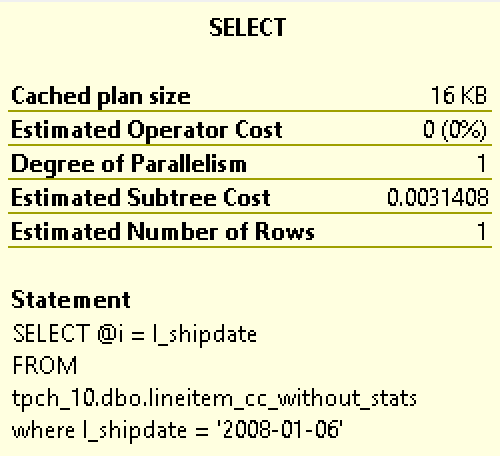 The column statistics are created in your scenario and they are indeed used. The limitation that exists until the vNext (upcoming SQL Server 2019) is that the statistics object is not persisted and not moved into the clone database. If I am not understanding your question, please explain it in more details.